Creepy, crawly parasites that bite and burrow into their host, not only dining on their blood, but possibly infecting them with disease. The host can be human or the host can be the family pet. Not many other bugs will make our skin crawl and make us jump up and down than a tick. Deer ticks, in particular, are known carriers of Lyme disease, the number one tick-borne illness in the US. New Jersey is one of the hardest hit areas based upon records from the CDC. One of the biggest misconceptions about ticks is that you can only get them trudging through deep forests and areas with high vegetation. Studies have shown the precise opposite. 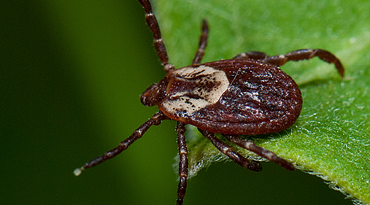 Approximately 70% of Lyme disease transmissions are from tick bites in one's own backyard. As larvae, ticks feed from small mammals like rodents, bats, deer, and other wildlife. Ticks ingest and store infected blood from these reservoir hosts and then progress into their tiny nymph stage. Nymphs inhabit vegetation as low as 4-6 inches, the typical vegetation found in anyone's own yard. 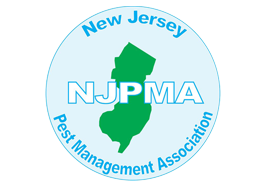 The NJ ticks then transfer the diseased blood from that host to whatever or whoever is unlucky enough to be their next blood meal. Ticks can be found in woody areas, grassy areas, near water, in shrubs or brushy areas, leaf litter, pine needles and woodpiles. They feed on birds, mice, squirrels and deer when the temperature is above 40 degrees. They do not fly or jump. 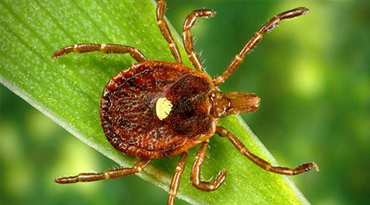 Ticks can detect heat emitted or carbon dioxide from a nearby host and they will stay on the host until full, but this may take several days. 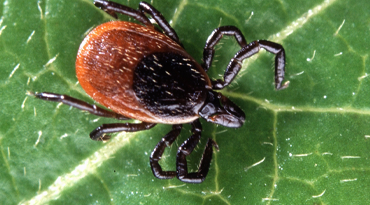 Ticks are most active in warm weather, but will attack a host at any time. They feed by secreting a numbing chemical so the host doesn’t feel their hard, stabbing mandibles pierce the skin. The mouthparts are barbed so our pets cannot scratch or rub them to dislodge the tick. Use fine-tipped tweezers and grab the tick close to the skin and near its head. Do not grab the stomach as squeezing it may release the toxins into its host. Do not twist or jerk the tick, as this may cause the mouthparts to break off and remain in the skin. With a steady motion, gently pull straight up until all parts of he tick are removed. After removing the tick, clean the skin with soap and warm water and contact your doctor if you develop any symptoms. Never use petroleum jelly, hot matches, nail polish remover or other products to remove a tick. To dispose of a tick, drop it in alcohol to kill it.